He was, his friends say, a man who liked a good time, a good story and a good cause. And since he successfully enjoyed each of those ventures, they also say he lived a good life. Retired Lt. Col. William N. Todd – a West Point graduate and Army veteran who became a Round Rock “Local Legend” – died June 10. He was 90. “If there was something that would help Round Rock he was all for it,” said friend Karen Thompson, an historian and Jollyville resident who recalled working with Todd on several projects. Todd was noted for involvement in many community activities and causes – so much so that in 1995 the Round Rock Historic Preservation Commission honored him with “Local Legend” status. Bill and Jean Todd arrived in Round Rock in 1976 or ’77, Bill Todd told Gilmore. They came here to care for his aging parents. Despite nearing age 60, Todd threw himself into community life, taking an active role with the Kiwanis and Rotary clubs, as well as Frontier Days and the Miss Round Rock Pageant. He was also a founder of and Sunday school teacher at St. Richard’s Episcopal Church. “He was gung-ho,” Gilmore recalled earlier this week. Part of the annual Frontier Days celebration – which used to be held downtown – recalls Round Rock’s 1878 Old West shootout, involving lawmen and the outlaw Sam Bass. In addition to his Frontier Days involvement, Todd’s name is woven through the fabric of more modern-day Round Rock history. As Marcial Guajardo reported in the April 12 Leader, Round Rock’s Mexican school – located near what is now Interstate 35, along Round Rock Avenue – closed in 1948. Todd bought the building (near where a Comfort Suites and Wendy’s restaurant are today) in 1953 and converted it into his family’s home. Although he was an Ohio native, Todd’s interest in Texas history and all things Texan extended to participation in the annual Texas Folklife Festival in San Antonio. Closer to home, Todd dressed in period costume and conducted tours at an old pioneer homestead in what is now the Wells Branch Municipal Utility District. Another Ohio native – Nelson Merrell – had settled in the Brushy Creek area in 1837 and built the cabin the late-1840s. “Sometimes he didn’t let the truth get in the way of a good story,” Thompson – the historian – recalled. “Sometimes we’d take an event and he would have a different take on it than I would. I would try to stick to the facts – and he liked a good story. Bill Todd and his wife, Jean, were married 61 years. She preceded him in death. He is also predeceased by a son, Will; and a grandson, Willie. Todd is survived by adult children Susan, Joe, Tim and Rick; plus grandchildren and great-grandchildren. The family will receive friends Friday from 5 to 7 p.m. at Beck Funeral Home, 15709 R.M. 620. Funeral services are scheduled for Saturday at 10 a.m. at Beck. LT. Col William Neely “Bill” Todd III (U.S. Army Ret. 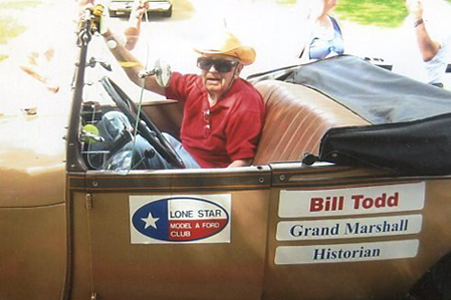 ), of Round Rock, Texas, passed away on 10 June, 2011 at the age of 90. Born 29 November, 1920 in Toledo, Ohio, Bill Todd is the son of a career Army officer who was with the mounted cavalry. He grew up with stations mainly at cavalry posts in Texas and Kansas interspersed with overseas stations in the Philippines and China, where he became an expert horseman. After graduating from high school in 1938 in Ft. Leavenworth, Kansas, he promptly enlisted in the Army in 1939. He then received an appointment to the United States Military Academy at West Point. After graduation in 1944 Bill married the love of his life, Jean, whom he first saw in an Auburn University newspaper where she was modeling as a student. Right away he said he was going to marry that girl. He saw action in WWII as well as commanded three outposts on the 38th parallel in Korea. He had a full and interesting career which included command and staff assignments in the United States, Europe, and the Far East with his wife and five children in tow. Bill holds Expert and Combat Infantry Badges and is rated as a Gliderman and Master Parachutist along with many more commendations and medals. Upon retirement from active service in 1967 he accepted a position as President and CEO of the Glenwood School for Boys near Chicago. At the time the Glenwood School was both a home and school for dependent and neglected boys from “broken” homes. Today the Glenwood School still thrives as a center of learning and a home for both boys and girls. To say that there were some interesting times would be a masterpiece of understatement, but the ten years spent there were the most satisfying and productive of his life. Bill and Jean returned to Texas in 1977 to care for his elderly parents who had retired to Round Rock in 1951. In addition to devoting himself to caring for his parents and his family he also devoted himself to the community of Round Rock. He worked tirelessly for the Kiwanis Club, Rotary, The Miss Round Rock Pageant, Frontier Days, and numerous other causes and events in the City of Round Rock. In 1995 the city awarded Bill the title of “ Local Legend”. 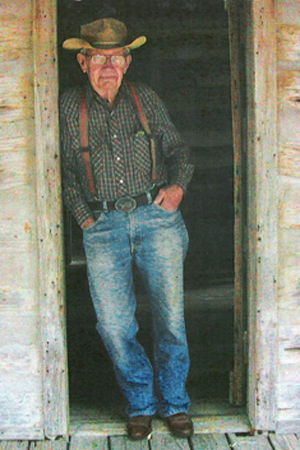 He worked for a real estate development company for several years during which time he helped to restore and foster an old log cabin, circa 1830-1850, in the Wells Branch M.U.D. that currently stands as a centerpiece of the Wells Branch Parks. He went on to become the resident “Curator” of the “Homestead” in Wells Branch, where he became known familiarly as the “resident liar”, and more formally as a folklorist. “A folklorist is commonly termed as a historian who doesn’t pay too much attention to the facts.” During his tenure at the Wells Branch Homestead he conducted regular tours explaining pioneer life in the mid and late 1800’s for school children as well as adults, an estimated 150,000 of which during 16 years, have been exposed to a dash of Texas history and an appreciation of pioneer life. He became a participant in the Texas Folklife Festival held annually in San Antonio, where he was a fixture of the “Back 40” for many years telling stories and sharing his knowledge with thousands of visitors from Texas and around the world. Known to his 5 children, 11 grandchildren, and 4 great grandchildren as “Papa”, he will always be remembered for his warm love, his humor, and his everlasting dedication to his family and many, many friends. The family greatly appreciates the high level of caring and love shown to Papa by his caregivers, his own A Team, Babs, Dodi, Arleen and Kris as well as Susan and Joe. Throughout his life he maintained the West Point creed of “Duty, Honor, Country”. Bill is preceded in death by his wife of 61 years, Jean, his son Will, and grandson Willie. He is survived by daughter Susan Todd Meyer and sons Joe, Tim, his wife Sally, Rick and his wife Deb; his grandchildren, Ben and his mother Barbara, Emma, Jesse, Christy, Lindsey, Ryan, Amanda, Johnny, Jeanne and Juli; his great-grandchildren, Cali, Josephine, Stella, Hailey and one on the way. To the very end he lived his life with dignity, compassion and a wonderful sense of humor. We will miss our beloved Pop. Visitation will be Friday, June 17, 2011 from 5:00 p.m. to 7:00 p.m. at Beck Funeral Home, Round Rock, Texas. Funeral Service will be held on Saturday, June 18, 2011 at 10:00 a.m. at the Beck Funeral Home, Round Rock, Texas.